John G. Linvill received the 1976 IEEE James H. Mulligan, Jr. Education Medal "For leadership as a teacher, author and administrator, and for contributions in solid-state electronics and technology." In addition to his recognition as an educator, Linvill was also known for being a co-inventor of the Optacon. This reading device for the blind was a handheld camera that could scan printed material and generate Braille images. Linvill desired to create such a device in order to help his daughter Candy, who had been blind since early childhood. Linvill was born on August 8, 1919 in Missouri and attended William Jewell College, where he received his A.B. in mathematics in 1941. He went on to attend MIT, where he received his B.S., M.S., and Sc.D. in 1943, 1945, and 1949, respectively. His thesis advisor was Ernst Guillemin. Linvill began his career at Bell Telephone Laboratories in 1951. In 1955, he joined the department of electrical engineering at Stanford. 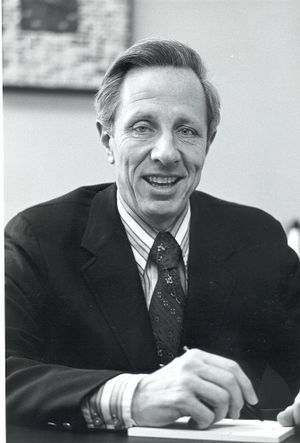 In 1969, he became chair of the department, and ten years later, served as Director of the Center for Integrated Systems. Linvill originally thought of the Optacon in 1962. He was spurred the technical development of the device, and in 1970 he, Jim Bliss, and other colleagues from Stanford founded Telesensory Systems (TSI) to manufacture the Optacon. At Stanford, twenty-one PhD students benefited from his counseling as first reader of their dissertations. He says his students become colleagues. His first PhD advisee, James F. Gibbons, was a Professor of Electrical Engineering at Stanford, and co-author with him of "Transistors and Active Circuits", which was translated into Japanese in 1968. In addition to numerous journal papers, his other publications include "Models of Transistors and Diodes" (1963), which was also translated into Polish in 1967, and Spanish in 1968. Linvill retired from Stanford in 1990. He served as chairman of the board of TSI and also led committees for the National Research Council, NASA and the IEEE. In addition to the Mulligan Medal, Linvill also received the American Association of Workers for the Blind John G. McAulay Award (1979), the Board of Directors of City Trusts of Philadelphia John Scott Award (1980), the American Electronics Association Medal of Achievement (1983), and the American Electronics Association (now TechAmerica) David Packard Medal of Achievement (1983). Linvill was a Fellow of the IEEE and an elected member of the National Academy of Engineering and the Academy of Arts and Sciences. He holds eleven patents. Linvill died on February 19, 2011.